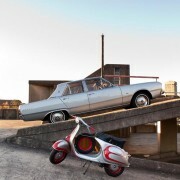 The owner of this classic Vespa is Mark Lecornu. 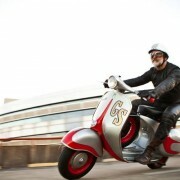 He is not only a classic Vespa specialist and connoisseur, but also my workshop right-hand man, God Father to my son Ryder and all-round great guy. 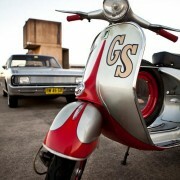 Even though Mark’s first GS 160 mark 1 was restored over 10years ago, it was still able to take out the “Best Vintage Vespa” the Classic National at the Gold Coast 2012. 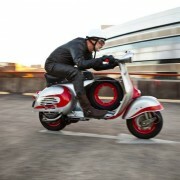 A testament to the high quality of his workmanship and attention to detail that he puts into every scooter. 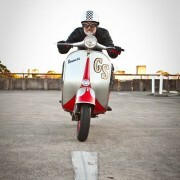 It is not just a show pony, as it is ridden almost daily and has been ridden in Australia’s first Mille Miglia (http://www.facebook.com/l/sAQFaepLeAQEjJa-Tvpme5sG-qkjVdiE7cFwWrx4DZf711g/scootermille.weebly.com/index.html). 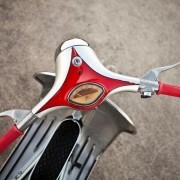 This GS 150 was rebuilt with the same mechanical sensibility of his GS160 (as both start first kick every time), but he was aesthetically inspired by the styling of the Grimstead Wildcat GS of the 60’s. 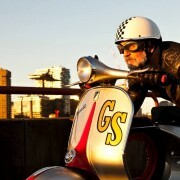 When Mark returned from the Mille he was riding this GS150 at the National Classic Scooter Rally in Sydney in October 2013 (http://www.classicscooterrally.com.au/).